Looking for a tour of Portland Maine lighthouses? Visit our Maine Lighthouses page! Known locally as “Bug Light”, this is the “fanciest” of lighthouses in Maine, looking very much like a tiny round Greek temple, complete with Corinthian columns. 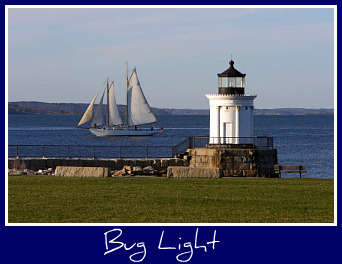 Built in 1875, it sits in Bug Light Park, which is owned by the city of South Portland. A great place for a picnic, Bug Light Park is comprised of 8.78 acres on the site of a former WWII shipbuilding complex where Liberty ships were built. Built in 1791, this is the oldest, and some say most beautiful, light station in the state of Maine. Portland Head Light was commissioned by George Washington and dedicated by the hero of the American Revolution, the Marquis de Lafayette. Ram Island Ledge sits on a dangerous pile of rocks that caused the end of many ships. Built in 1905, this is one of Maine’s “newer” lighthouses. It can be seen from Fort Williams State Park, which is also the location of Portland Head Light, off Shore Road in Cape Elizabeth. Spring Point Ledge lighthouse, made in the "spark plug" style, sits on a breakwater by a main channel into Portland Harbor. It was built in 1898. 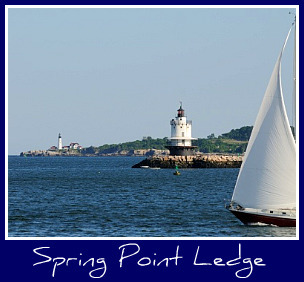 Spring Point Ledge light can be reached by heading south on Route 77 in Portland and continuing on Broadway, turning right on Pickett Street and then left onto Fort Road, which ends at Fort Preble and a parking area. The name "Halfway Rock" comes from the position of the rock which is halfway between Cape Elizabeth and Cape Small, Maine, the southwestern and northeastern points of Casco Bay, which are about 18 nautical miles apart. This lighthouse is not open to the public, and is accessible only by boat or helicopter. A marine railway was destroyed by the late-season storm made famous in the book “A Perfect Storm”.